Want to know how to make a stencil? It's fun to create a pattern from a picture you love and have the ability to reproduce it again and again. It's easy too! Let's say you found the perfect image and want to make it into a stencil. Well, there are many ways to make a picture into a stencil and it all depends on the image the best way to create a stencil. So, let's explore a couple of options and then don't miss the video down below. First you need to decide if your image will work best as a Single Overlay Stencil or a Multiple Overlay Stencil. If you need to know more about these options and the differences, check out our discussion on Stencil Patterns, which will help you decide what is going to work best with your image. By the way, you may also want to explore how to turn pictures you have into a Photo Stencil where you'll find out how this Venus de Milo was turned into a stencil. So, what do you want your stenciled image to look like? Do you want a silhouette or ghost of the image? Are you looking for a simple picture with one or few colors that has little detail? Or do you want a final image that has more of a hand painted look? It might help to look at your image in a different way. How much detail is in the image? And how much detail do you want to keep for your stencil? You need to try and visualize your image as if it were broken down into layers – maybe by colors or maybe by shadows versus light areas. Needless to say, the fewer the details the better the image for creating a stencil. At least, when you are just starting out. The best images for how to make a stencil have high contrast with few variations. What does that mean? Well, in order to create a stencil you need to break it down into sections and the more color variations and shaded areas the more complex your job. I should tell you this, Single Overlay Stencils are less work when it comes to stencil painting but can be a little harder when it comes to designing. Take a good look at both options before deciding and then take another look at your image. OK! Let’s say your image is a black and white photo. That’s pretty easy and takes a lot of the guess work out of it for you – it will work best as a Single Overly Stencil. Or, perhaps, your picture has a few details but you are only looking for the silhouette or ghost of the image as your final painting. 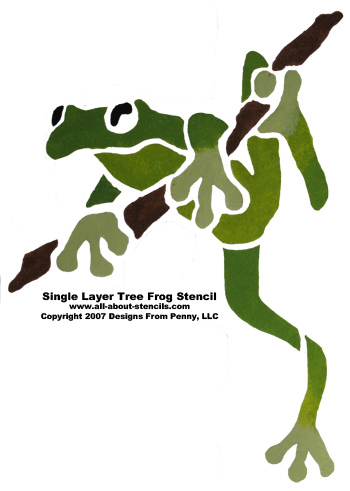 If so, find out how to make stencils with Single Layers (you can click on the Single Layer Frog Stencil too). 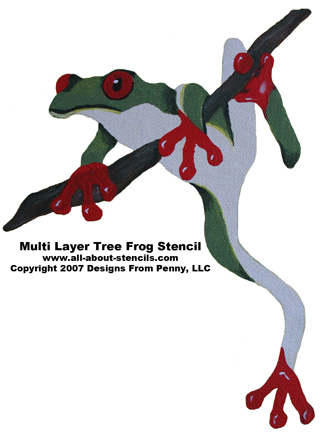 Actually this single layer frog is one of our free stencils just in case you want to play around with him! So, you've taken a good look at your image and decided that you want to keep the detail and you really desire the hand painted look. Great! A Multiple Overlay Stencil will get your where you want to be. You'll be making stencils with Multiple Layers which is the next step of learning how to make a stencil. After you've designed your own stencil and really put some work into it you'll want to preserve it for future use. Or maybe you want to use it multiple times. Click here to get some stencil making tips and techniques for preparing your stencils for permanent use. I know I'm a little crazy about my passion for stenciling but learning how to make a stencil added a lot of excitement to this craft for me. I hope it does the same for you! You'll want to get your hands on some special materials. For instance, you may want to use sheets of mylar or acetate instead of paper for multiple use or permanent stencils. When looking for a material to make stencils you’ll want a product that can accept ink without smudging or pooling. Remember that a glossy finish will not accept ink and will cause paint to run (and seep under your stencil). So I would highly recommend a product that has a matte finish on both sides. For all of its usefulness, acetate does cause a few headaches — ink that won't stay, a yellow or grayish cast as it ages, edges that curl. Grafix Dura-Lar is the acetate alternative. It combines the best features of Mylar® and acetate, and offers a variety of products so that you can purchase the film that suits your needs precisely. It is always consistent in color and overall clarity, and won't discolor with age. Dura-Lar is archival quality, safe for overlaying artwork, and it lays flat. It will remain dimensionally stable for as long as you need. When learning how to make a stencil you will find that there are many options for the materials to use. In fact, I've heard of people using report covers or clear transparencies. Again, I'm trying to give you as many ideas so that you can experiment and find what works best for you! has a large supply of stencil making materials including the Dura-Lar acetate alternative products. You can find acetates in rolls or sheets, colored or clear, matte or glossy and even adhesive backed. Experiment until you find the one that works best for you. Another stop when seeking stencil making materials is MisterArt.com Discount Art & Craft Supplies--Up to 75% off!
. They have a few options of films (for permanent use) and Bee Paper Stencil Oil Board which is cardstock thick so you are able to use more than once when stenciling (but not permanent). You'll find they have a dedicated crafts section for stenciling. I know I'm a little crazy about my passion for stenciling but learning how to make a stencil added a lot of excitement to this craft for me. I hope it does the same for you! Here are a few tips for cutting out your stencil. Rotate the stencil with one hand while you continue to cut in as straight a line as possible, steadily and gently pulling the blade towards you. This will keep your wrist in a more comfortable and natural position and give you more control so you don't make mistake cuts. Twisting your wrist to cut along a winding line is more difficult. Well, that's it for how to make a stencil (for now, anyway). I hope you found what you were looking for and are now inspired to create your own designs. Oh wait! Here's that video I promised you. What a great video on how to make a stencil? And it's so good to see it in action. Stencils used as examples on this web site are courtesy of Designs From Penny. Return to Home Page from How To Make A Stencil. Return to How To Stencil from How To Make A Stencil.